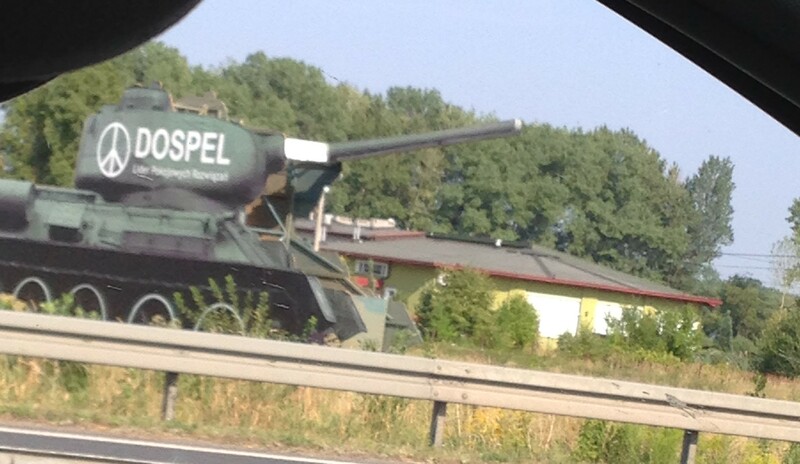 So now we’re driving along admiring the countryside (and the weird things on the side of the road, like this tank)… when a strange noise starts coming from the car when we hit little bumps in the road. We were getting ready to pull off and look when a kind man in the car next to us at a stoplight tries to tell us….in Polish….that something is wrong with our car and keeps pointing to the back of the car. We just nod a lot because we have no clue what he is saying. 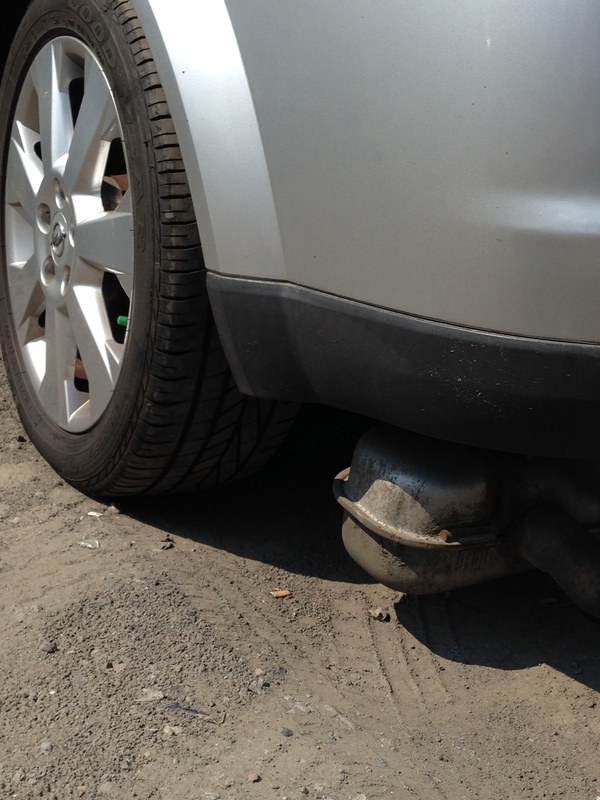 So we pull off into a small seemingly abandoned lot and realize that the muffer/catalytic convertor is falling off the car. David (being a man) tries to crawl under the car to put it back on. Me (being a woman) says…”There’s a man over there. Maybe he can suggest somewhere to get it fixed.” David (still being a man again) says “Let me just crawl under the car and put it back”. Me (still being a woman) says “There is a man over there. Let’s ask for help”. David (still being a man) says authoritatively (as he dust’s off all the dirt and gravel that is now on his clothes) “I think I’ll ask that man over there for help”. About 20 minutes later we finally made it to this restaurant where David had planned to stop and eat. 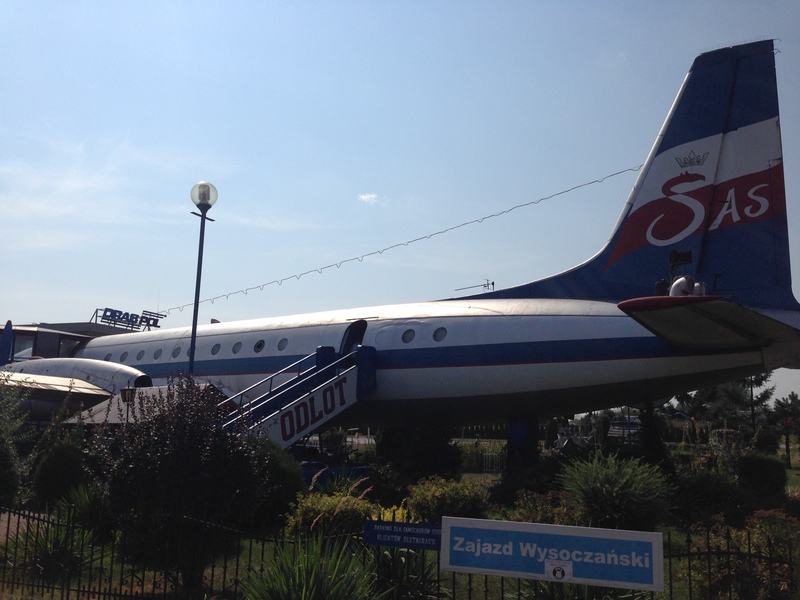 An aviator’s dream…a plane that’s been turned into a restaurant. 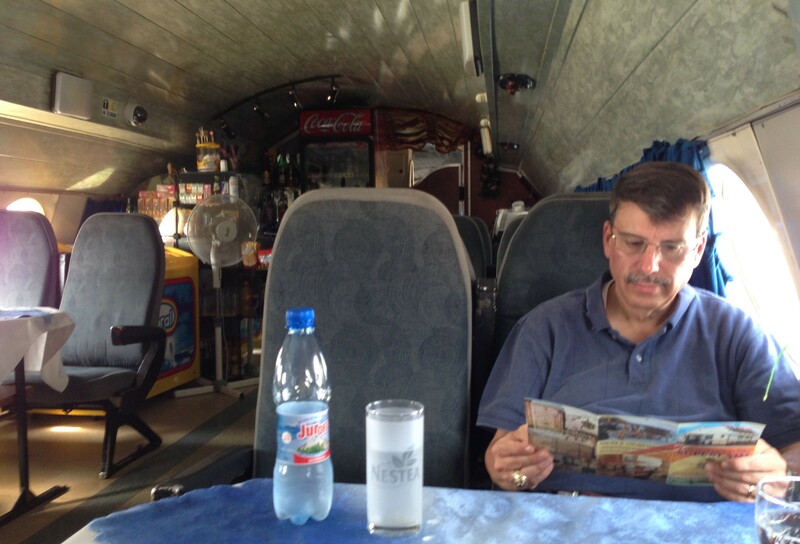 No air conditioning, and a little rustic, but a plane nonetheless. 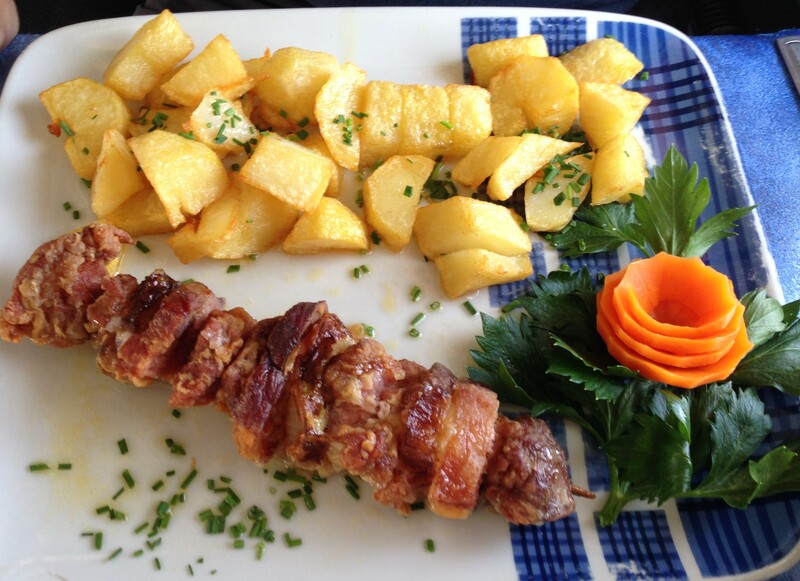 Some unusual things were on the menu..ostrich & turkey stomach…which we didn’t try, and the food looked good…this is David’s bacon kabob …although David got sick several hours later. 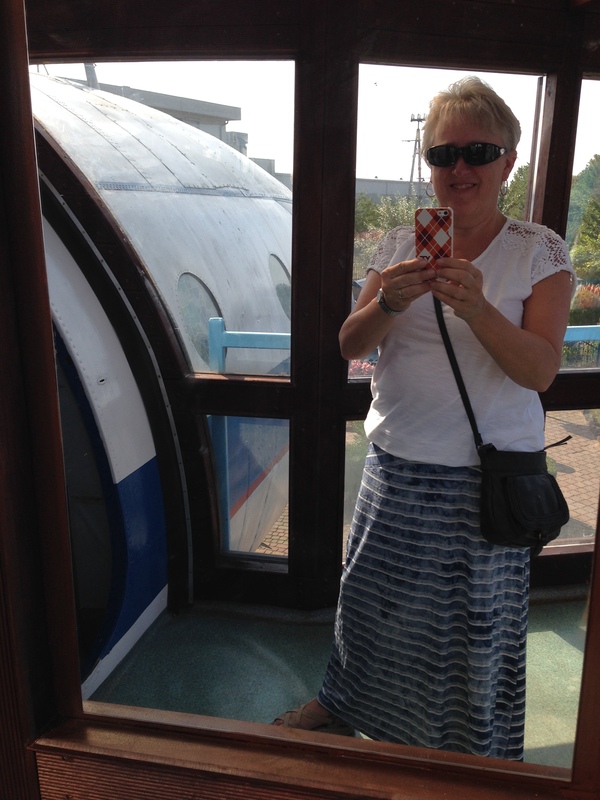 While I was waiting for David (yes, the plane/restaurant had working tiny airline bathrooms) I seized the opportunity and decided to amuse myself by taking a photo of myself in the mirror. I’m easily amused. 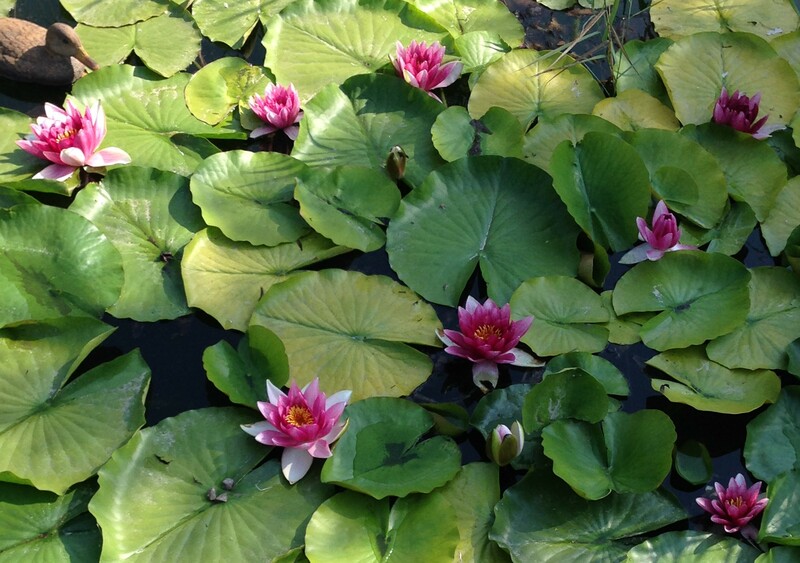 …and then one of the pretty lily pond next to the plane. 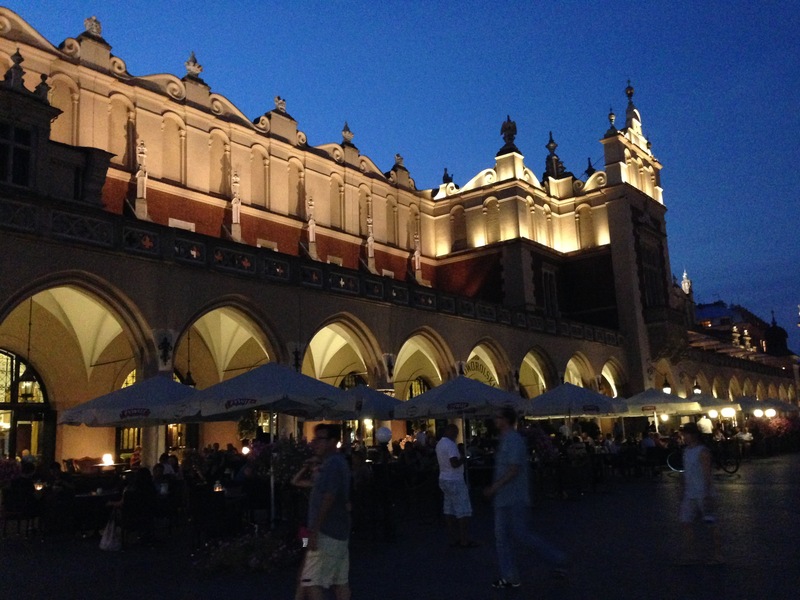 After a few more hours, we finally made it to Krakow. We walked to the Old Town area, but didn’t spend much time there because we were tired after the long drive and David still didn’t feel well. But I did manage to get a few decent nighttime pictures. 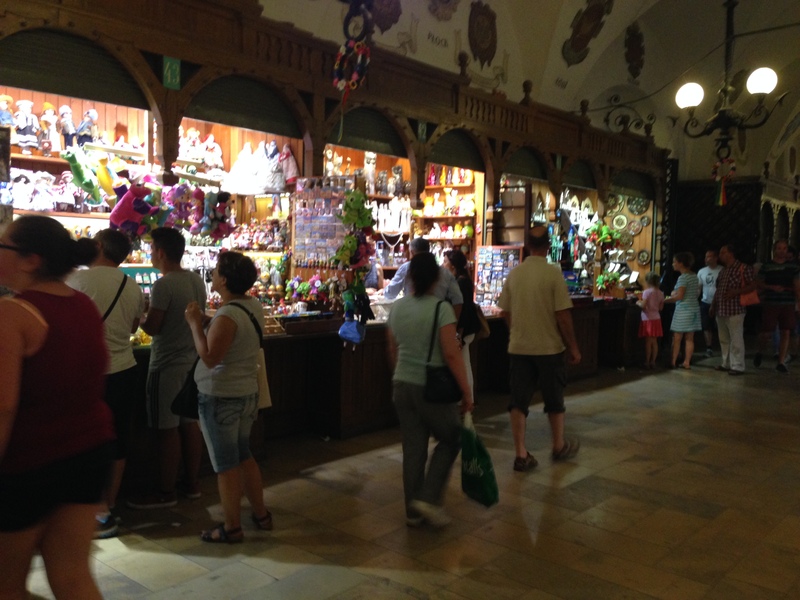 This is Cloth Hall….Outside there’s a few restaurants & bars but inside it’s a huge marketplace. Below is St. Mary’s Bascilica. 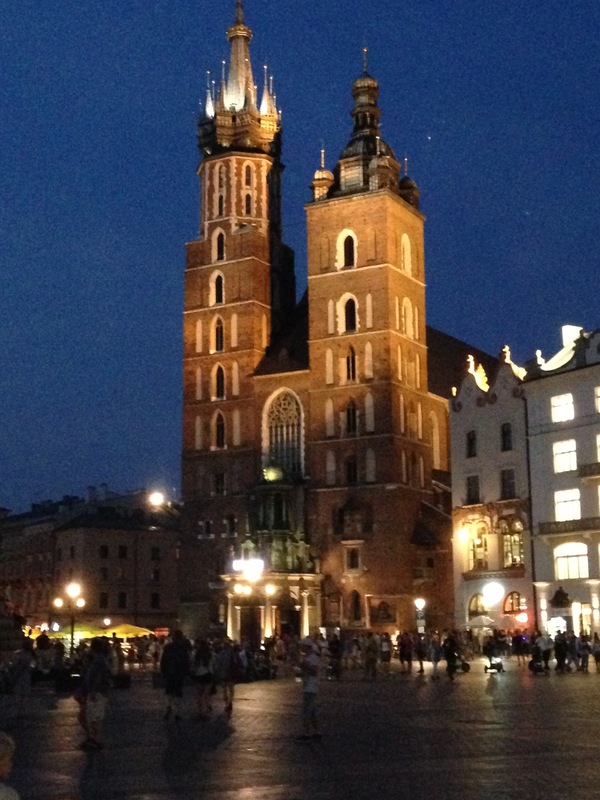 Every hour on the hour a trumpeter appears in the window (on the round tower) and begins to play the Krakow’s famous bugle call (the hejnal mariakci). However the bugler stops playing midway through in honour of the mythical trumpeter who was shot in the neck while belatedly warning the city of invaders. The bugler stops playing, waves at the crowd and then plays again from a window on the opposite side of the tower. He does this 4 times (once on each side) and then he’s done. And just like that we were done for the day too and headed back to our hotel. Love your blog Patricia!! Sending hugs.